and its cancer-curing predecessors in Chapters 1 and 2 of Meditopia®. Since the kidnapping of AO Labs' Founder, Greg Caton, (2009 to 2011), as detailed in Meditopia, there has been a pronounced increase in attention given to both Alpha Omega Labs and the case itself by the alternative media. (Obviously, the mainstream media -- which is funded by the pharmaceutical companies -- will never cover it.) Many of these interviews are littered with testimonials from both the hosts and random callers into the respective shows. Show highlights: This is a wide-ranging interview between Mel Fabregas and Greg Caton concerning the corrupt nature of government, and how this affects all aspects of human life. (The first hour is also available on YouTube.) 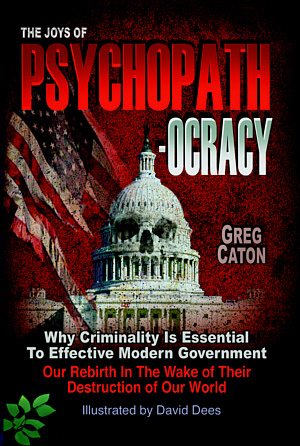 This is the first public interview to introduce Greg's new book, The Joys of Psychopathocracy: Why Criminality is Essential to Effective Modern Government / Our Rebirth in the Wake of Their Destruction of Our World. More detail is provided on Greg's personal site, gregcaton.com. There is a link to a PDF on the home page that contains the opening pages and introduction to the book. The relevance to Alpha Omega Labs and its work is that the book provides a framework to explain why in the current age it would never be possible for governments and the power structures that surround them to ever endorse natural medicines, or unexpensive, non-patentable healing approaches that actually work. Show highlights: Corruption in the U.S. Federal System : see Chapter 3 of Meditopia We're living on a dying planet. Entering sixth mass extinction. Wilburn Ferguson and the cancer-beating, 7-herb remedy, Amatosin, which can no longer be made because some of the herbs are now extinct. Cansema (Black Salve) info at Meditopia.org -- Chapters 1, 2, and 4 Two forms of Cansema: topical for skin cancer and internal for internal cancers. Cansema alters the membrane of a cancer cell while leaving normal cells alone. Most effective for skin cancers, the most common form of cancer. Altcancer.net/cutting.htm: Do not ever cut into a cancer unless you want it to spread. Not all Black Salve is Cansema. Instructions on YouTube for making it. Most products on Amazon and EBay are counterfeit. There is no cancer cell type that will not react with an escharotic salve. If it doesn't react, it's not cancer. Hydrogen therapy for general health. Cancer has morphed and is not the cancer of 50 years ago. Cancer is more effective and complex now, making prior natural treatments ineffective. The cause of cancer is subjecting the human body to conditions it's not able to properly deal with. We have constructed a civilization that is anti-human. Homo industralis. And more! This is a two part interview, the first of which covers a brief history of Alpha Omega Labs, including grisly details of the interviewee's imprisonment, the many levels of government corruption that were made manifest in his case; as well as details of discoveries made on the path to uncovering suppressed cancer cures. Part 2 covers more about specific remedies, interesting ethnobotanical facts about them, and some rarely publicized information about various Amazonian and Andean cures. "Black Salve is a traditional treatment for skin cancers, as well as tumours that are not far below the surface of the skin, such as some breast tumours. [The term "traditional" is almost an understatement. We document in Meditopia just the last 500 years of suppression, but solid evidence exists that it goes back much farther. The comment on breast cancer is true . . . see Case #052312 in the Cansema Testimonial page for 2011-2013.] Black salve traditionally contains the herb bloodroot (Sanguinaria canadensis) and other herbs as well as zinc chloride. [The use of bloodroot is overplayed, as chaparral works just as well -- though we use them both. Students of escharotic medicine had better get used to this idea, because at the rate we're going, we could see the extinction of bloodroot within the next 50 years. From our own lab work, we can report that bloodroot is a very difficult germinator, and when the plant does mature, it takes another seven years to get a harvestable root. Moreover, this plant grows only in certain places in the Appalachian Mountains and along the Atlantic seaboard of the U.S.] Issue 1 of this journal features a major article on black salve by naturopath, Adrian Jones [from Australia -- with whom we correspond frequently] . . .
Use of black salve can be painful (in some cases the pain is sufficient as to require the use of opiates) and can also be accompanied by extensive inflammatory reactions around the site of the tumour. [We would have liked our pain management techniques to be discussed at this point.] . 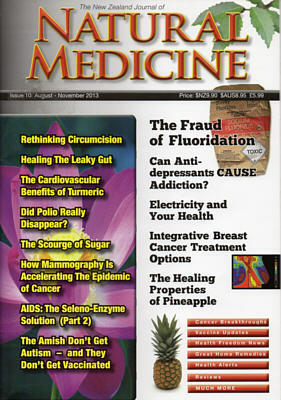 . . "
The NZ Journal of Natural Medicine is an excellent publication. To get a full copy of Issue #10 and any other editions of this magazine, contact Jenny Hammond in "Subscriptions and Special Sales" at jenny@naturalmedicine.net.nz . . . Since my extraordinary rendition in 2009, more media attention has been given to our work than ever before. The picture above links to the first hour of a two hour interview, released to the public on October 29, 2013, dealing with Alpha Omega Labs, the validity of Cansema® as an approach to treating cancer, etc. 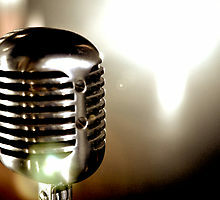 The second half of the interview can be heard at Sanitas Radio by clicking on "Listen to Part 2." (A small subscription fee is required -- which is quite reasonable). Over the course of the interview, the host, Mel Fabregas -- best known for his powerful interviews on Veritas Radio -- makes frequent reference to those he has known were have been cured of cancer using our products and techniques. It's a worthwhile listen . . . with no commercial interruptions. This October, 2013 interview with Patrick Timpone -- with testimonial statements by the host and anonymous call-ins makes for interesting listening. Titled "The Great American Medical Holocaust; the Tyranny of the FDA and the Suppression of Natural Remedies," the show itself covers the FDA-sponsored extraordinary rendition of 2009 and many interesting facts surrounding the work of Alpha Omega Labs. Testimonial inputs are made by both the host and the "call-ins." 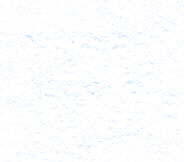 We normally post individual testimonials, based on information submitted by end users. This YouTube video was posted in September, 2011, and contains the testimony of popular alternative media host, Mike Adams (www.NaturalNews.com), who is familiar with numerous individuals who have been "cured" by Cansema®. (See/hear section from 0:58 to 1:15 on the video). The story pertaining to Cansema® and my FDA-ordered, illegal kidnapping in 2009 takes up the first 4:45 minutes of the presentation. This video is a follow-up to Mike Adam's coverage of these issues going back to his December, 2009 announcement of my initial kidnapping, which involves an interview by Mike Adams with Cathryn Caton, N.D. (my wife and AO Labs co-founder). A medical research organization in Australia, Panacea-BOCAF has been collecting hundreds of case studies, including pictures and confirming medical reports, to formally document the successful use of Cansema® and other alternative treatments. One of their goals is to have a sufficient mass of documentation to refute the claims of the Australian TGA that "Black Salve" (the common name used in Australia for escharotics like Cansema®) has not been shown to cure cancer -- let alone that it does so consistently for a broad number of cancer types. Predictably, the TGA has done everything possible to prevent this information from getting out to the public. It even went so far as to close down the website of one AO Labs' customer, Nirvana Anderson (see below), for even DISCUSSING Black Salve as a legitimate therapeutic option . . . Forget guns . . . Negating freedom of speech is a far graver violation of civil rights by corrupt governments. The findings of Panacea-BOCAF are covered in the January / February, 2013 issue of Veritas Magazine. This video isn't specific to Cansema®. It's put out by The Truther Girls, who expose suppressed technology and knowledge that those in power would rather be kept in the dark . . . and the subject is skin cancer cures that work. Two "cures" are mentioned: ( 1 ) Black Salve, of which Cansema® receives the greatest attention, and ( 2 ) Hemp Oil. It's informative, worthwhile, and easy to understand (i.e. in layman's terms). Cansema® is covered at 4:33 on this 9:55 minute track. AUGUST, 2012 -- This series of four interviews on the subject of "Black Salve" comes from Leon Pittard, host of FairdinkumRadio.com in Australia. My own interview (i.e. 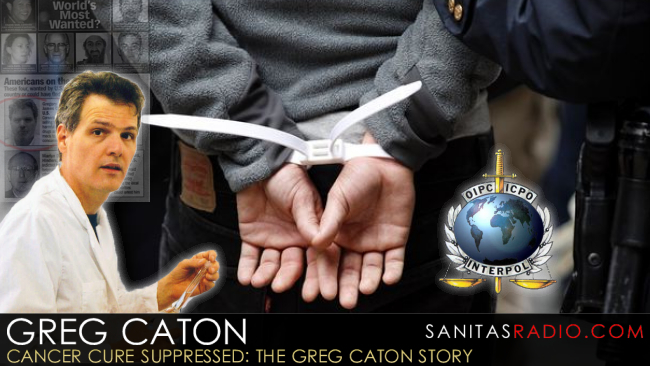 Greg Caton) is the third in this series, but numerous testimonials about "Black Salves" generally, and Cansema® more specifically, are made throughout the other interviews. This ten minute video (first posted in Dec., 2010) isn't about Alpha Omega Labs or even Cansema, per se . . . but it's a powerful tour-de-force on the suppression of effective products that do not conform to the giant corporate model. Clips with Mike Adams, Greg Caton, Cathryn Caton, George Hemminger ("Survive and Thrive TV"), Lloyd Wright ("Hepatitis C: A Do-It-Yourself Guide for Health"), and officials at Rawesome Foods appear throughout the presentation. Mike Adams reaffirms the many testimonials he has received on the curative properties of Cansema® -- whose history is recounted in Chapters 1 and 2 of Meditopia®	. Well worth watching. Okay, okay . . . this isn't a testimonial or a media interview. We've seen so many parodies of the popular "Hitler Rant," made famous by the German language film, Der Untergang, that we couldn't resist throwing our hat in the ring . . . Enjoy!